Delivery of second Couach 5000 Fly superyacht BELONGERS – Superyachts News, Luxury Yachts, Charter & Yachts for Sale. Among other things, superyacht Belongers illustrates Couach shipyard’s legitimacy in the realm of super yachts, having proved its capacity to execute a superb finish that meets the requirements of a justly demanding clientele. The owner and his surveyors have expressed their satisfaction in terms of constructi on quality and the impeccable finish for a vessel delivered on time. This quality can be seen in the perfection of the interior fixtures, the result of the shipyard’s crafsmen’s know-how and a fruitful collaboration with METRICA® Interior. In pure COUACH shipyard tradition, the owner played an active role decorating and customizing the fixtures of his yacht in its entrety, creating his dream yacht, drawing on his fve years’ charter experience on the most prestigious super yachts. 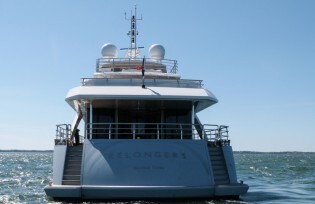 Concerning the delivery of Belongers yacht, Christophe Kloeckner, President of Couach shipyard states: “Thanks to the innovations developed on this new 50 metre unit, COUACH reasserts the identity of the brand: intelligent shipbuilding and technological superiority, reflected in navigation comfort. Beyond these words, we highly appreciate the admiration and extreme satsfaction expressed by the owner’s experience sailing his COUACH. Couach’s R&D department is currently working on new technological innovations that contribute towards improving comfort, in order to maintain and strengthen this leadership”.